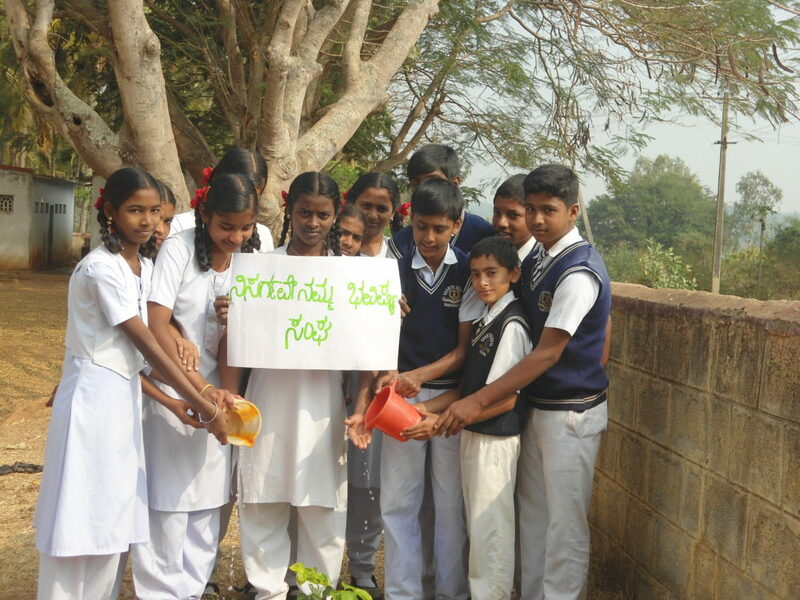 Muddanahalli christened as Shanthipura is a village situated in a remote area 40 kilometers south-west of Mysore City. 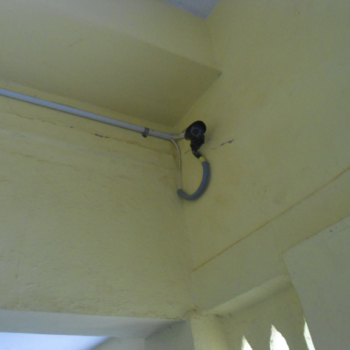 It was a very backward village deprived of every facility including the basic needs. 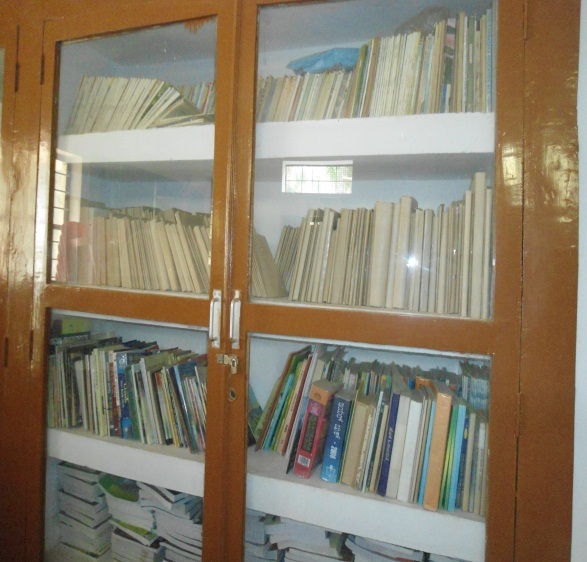 People worked very hard and were not at all exposed to the outside world. 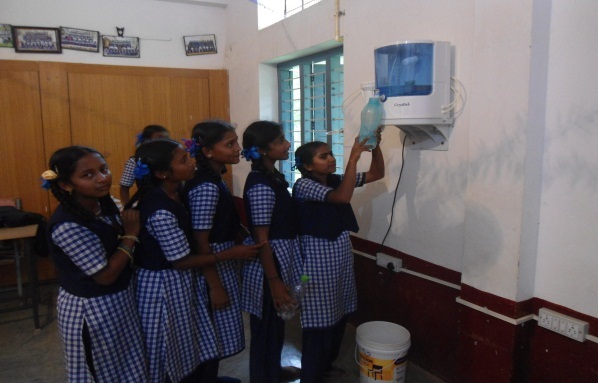 Basic education, hygiene and primary sanitation were not in the vocabulary of the people. 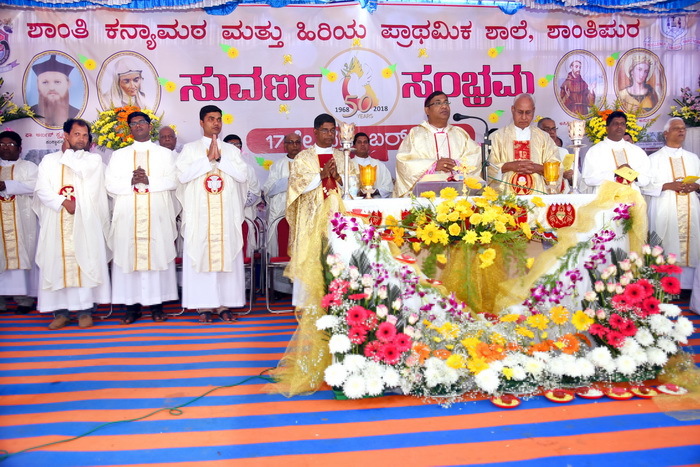 Bishop Mathias Fernandes being aware of the needs of the people wanted to begin the service to the people. 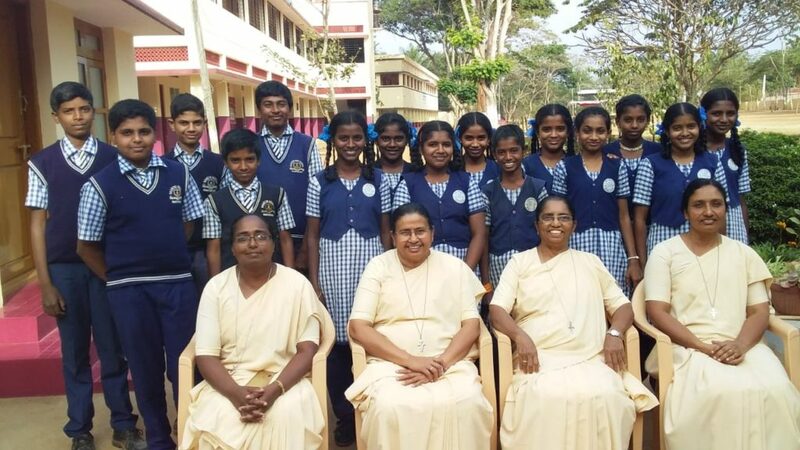 Having witnessed the work of the Ursulines at the grass root levels in Hunsur and Naganahalli he approached the Superior General, Mother Genevieve Castelino. The Ursulines took up this difficult task with earnestness as they had a charism for this type of work with their motto, ‘For the love of God’. 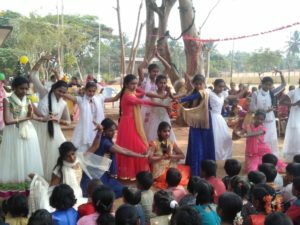 For almost three decades Sisters concentrated on the primary education of the children at Shanthipura. There was no high school nearby. 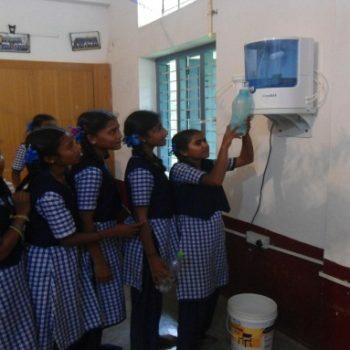 Those who could afford would continue their education travelling quite a long distance. 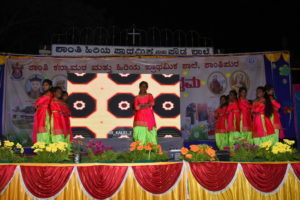 The girl children were at a loss. 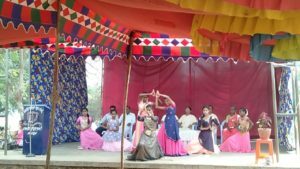 Parents would not send their daughters far from the village and hence the girls were deprived of further studies except for a few privileged ones among them. Society was changing and higher education became a necessity. 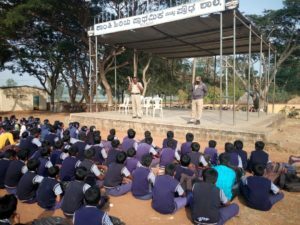 Hence the decision to start a Kannada medium high school was taken. 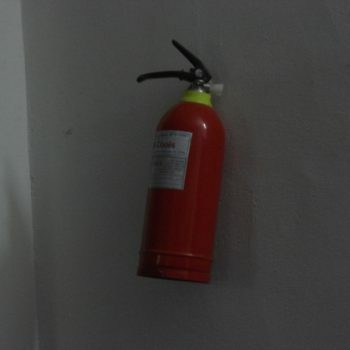 In the year 1997 permission was obtained from the Department of Education for a high school. 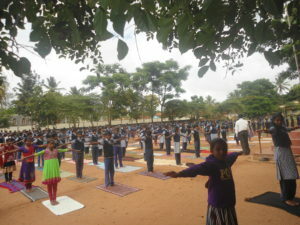 But the problem of a school building and trained personnel was a great drawback and so the classes could not be started. 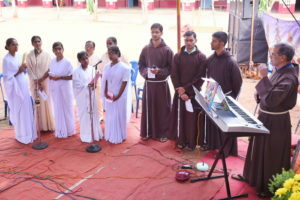 Fr Patrick Langue SJ and the French group of volunteers through the mediation of Fr Claude D’Souza SJ offered to fund the construction of the high school building. 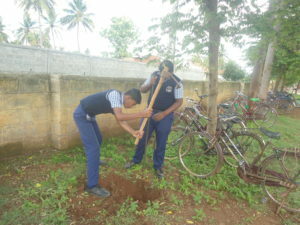 Sr Placid Saldanha supervised the construction meticulously. 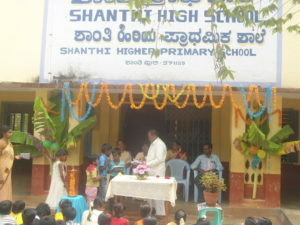 In the year 1998 permission to start the school was renewed and Shanthi High School was started. 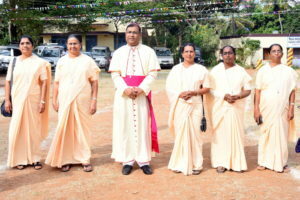 Sr Nelly D’Souza, (1998-2000), Sr Cecilia D’Souza (2000-2006), Sr Leena Fernandes (2006-2010), Sr Leena Barboza (2010-2013) and Sr Mary Machado(2013-2016)were the headmistress in the past years. At present Sr. Cosess Gonsalves is the Headmistress of the school and works hard for the development of the students. 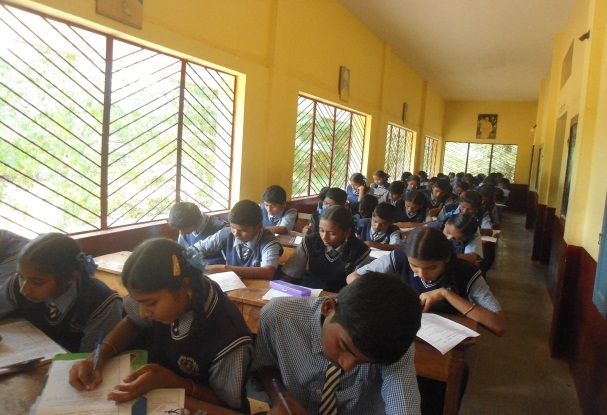 At present there are 152 students studying in the school. 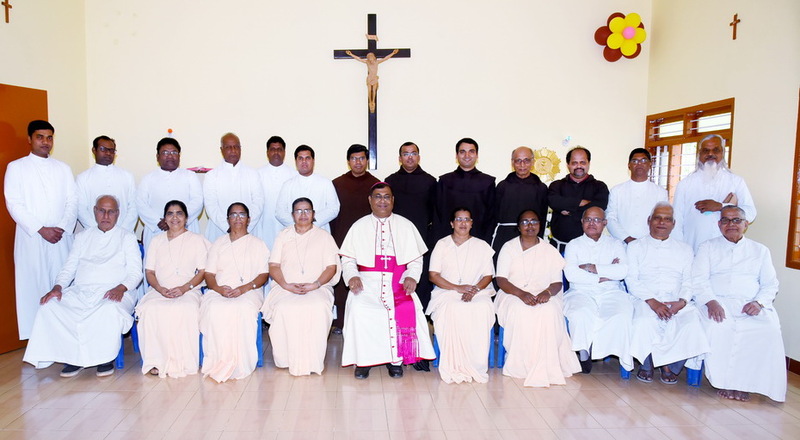 Sr Cocess Gonsalves hails from Sundekere. 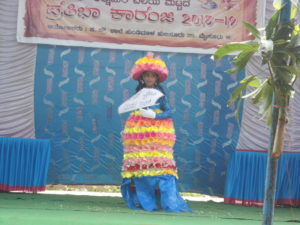 She completed her rimary Education in St. John’s Primary school, Kokkada, Puttur Taluk, D.K. 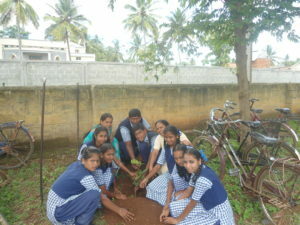 and High School Education in St. Joseph’s Girls High school, Sakaleshpura, Hasana, Distirct. 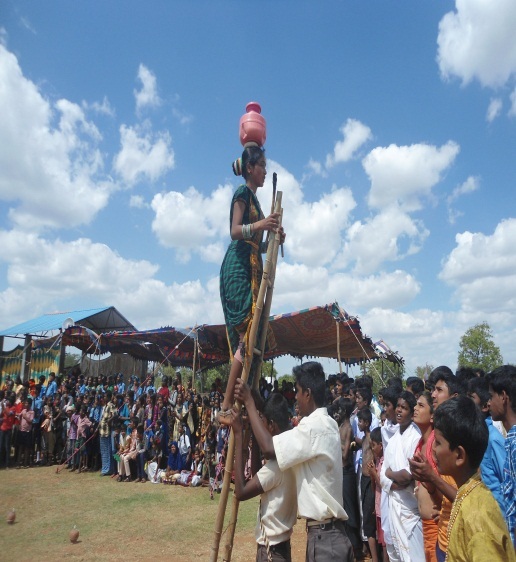 She did her Pre- University College studies in Marimallapa’s P.U College, Mysuru. 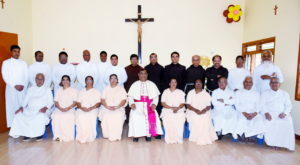 Sr. Cocess Gonsalves obtained he degree Bachelor in Arts (B.A) through St. Philomena’s Degree College, Mysore and Master in Arts (M.A) through Mysuru University, Manasagangotri, Mysore. 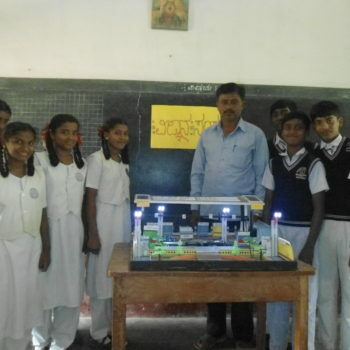 Sr. Cocess Gonsalves obtained the Professional Training Bachelor in Education(B. Ed) through Indira Gandhi Open University and Master in Education (M. Ed) Mysore Open University, Mysore. 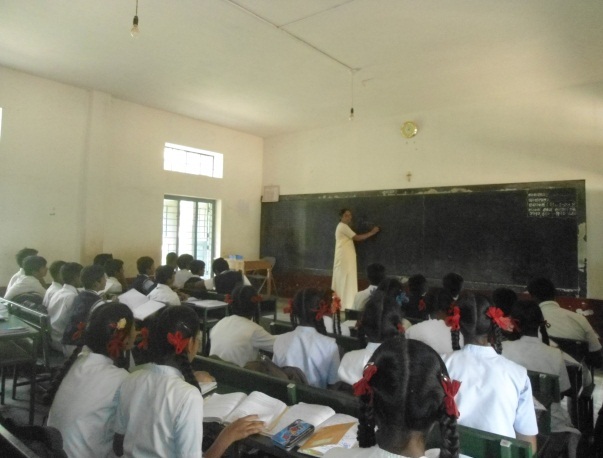 Sr. Cocess Gonsalves stted her career in teaching in the year 2006. 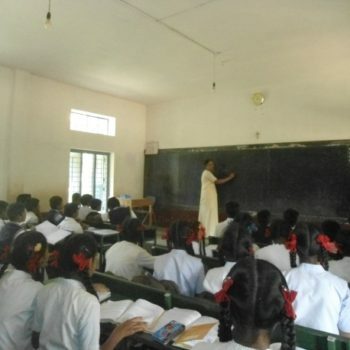 She taught as a lecturer in St. Joseph’s P.U.College, Hunsur, As a Teacher in Sacred Heart High School, Hirebyle and served as a Headmistress in St. Joseph’s English Medium School, Koppa, English Medium School, Koppa and from 2016 she is working as a Headmistress in Shanthi High School, Shanthipura. 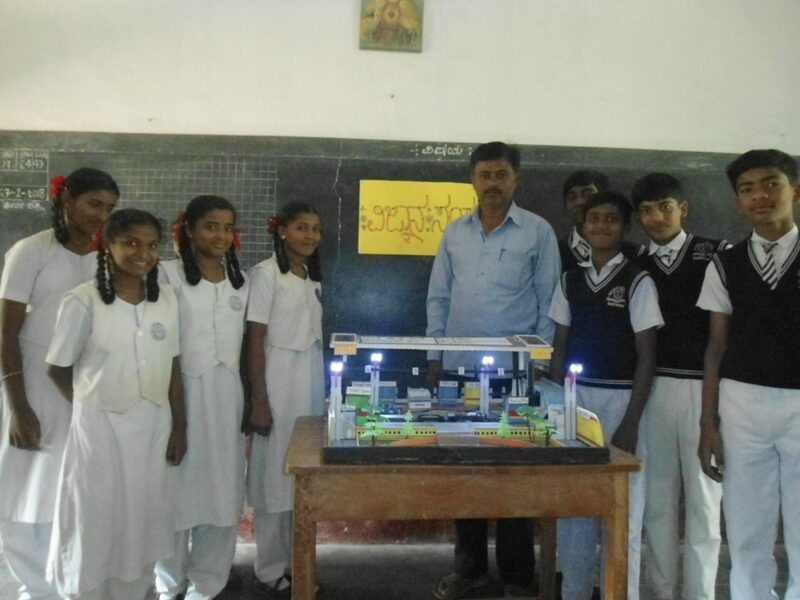 Sr. Cocess aspires to build innovative, Creative and Concrete insights in the students . At the request of Bishop Mathias Fernandes Sisters Ephiphania Fernandes, Clotilda JK and Magadalene D’Souza arrived at Shanthipura and lived in a rented house. 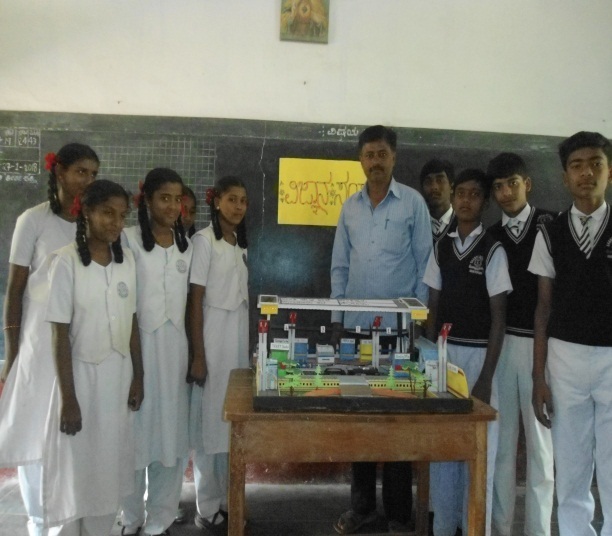 Fr Jacob Thadical worked very hard to build a four room multipurpose structure. It was inaugurated on June 26, 1968. 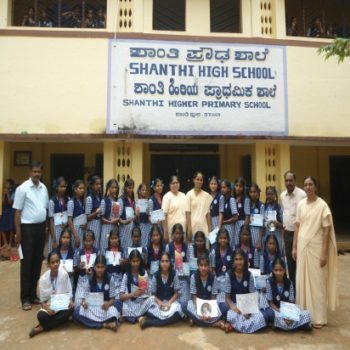 Shanthi Higher PrimarySchool caters not only to the educational needs of the poor village children but helps in their formation with the right values and encourages them to pursue higher education. 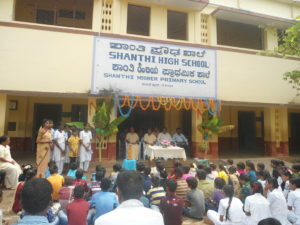 The building was not yet ready and in the first year classes were held in the old primary school building and Gramabhivraddi Kendra, the social development centre of Shanthi Convent with 42 students. 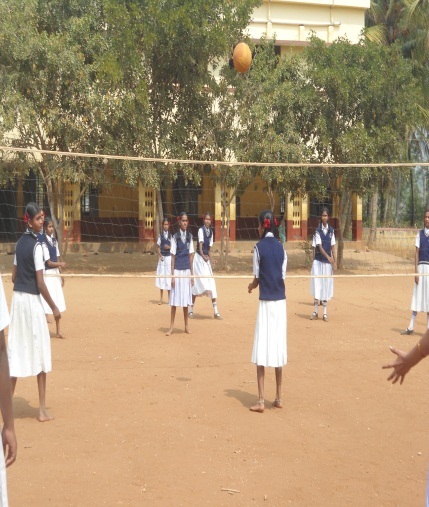 Sr Nelly D’Souza the pioneering headmistress used her head and heart to make things happen. 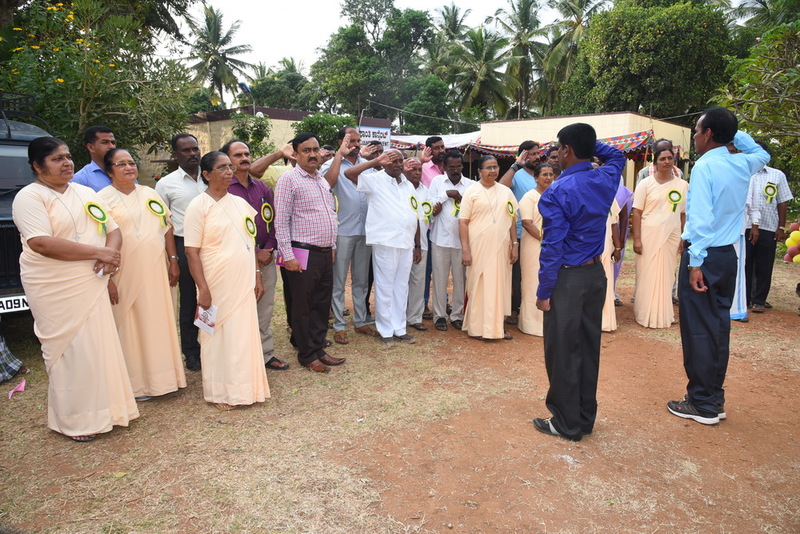 Fr John F Texeira, MsUsha Rani, Sr. Veena Vijaya Castelino, Sr Laura Pinto, Mr Mohan and Mr. Sanna swamy joined hands with her in this noble but difficult task. 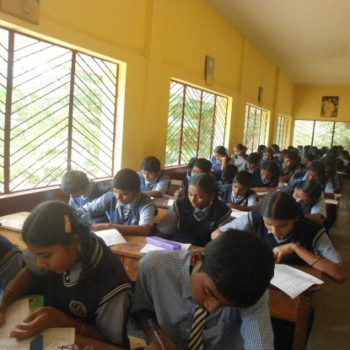 Since it was a Kannada Medium School the payment of the staff was difficult, and the Management faced hurdles. 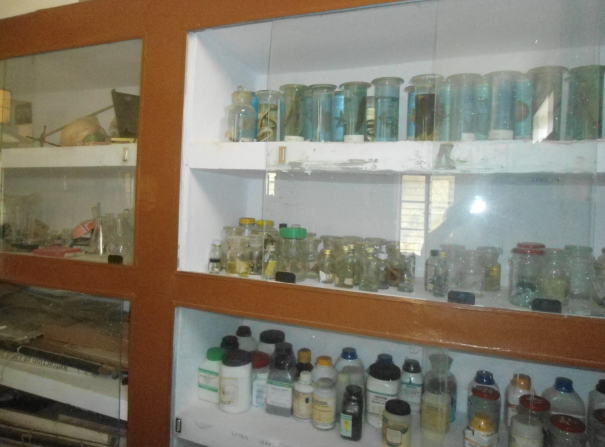 Collection of tuition fees was beyond one’s comprehension as the people were poor. 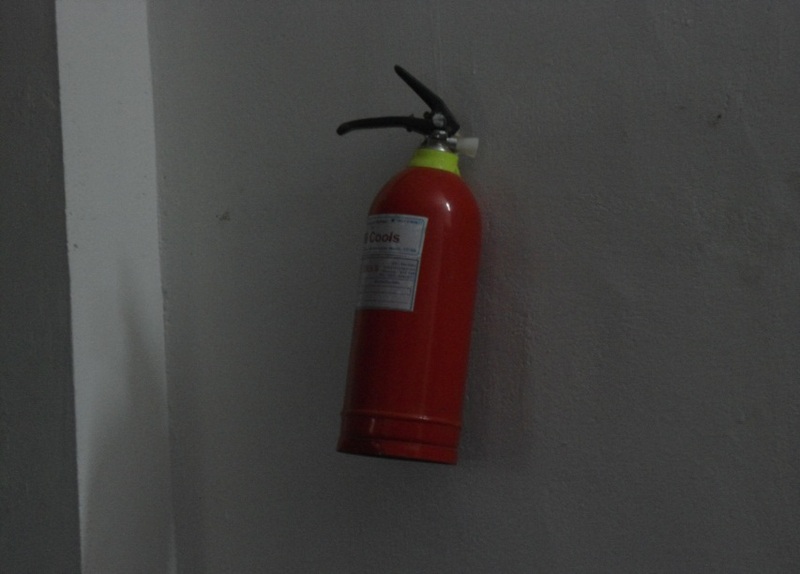 Once again Fr Patrick Langue came to the rescue of the Management with an excellent idea i.e. 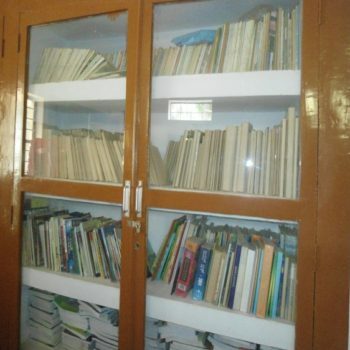 to have a Trust Fund to pay the salary of the staff for which he volunteered to contribute 50%. 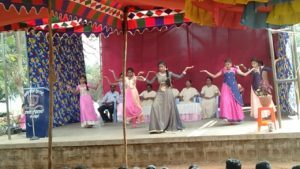 The Mysore Province and the Generalate jointly made the other contribution and to date the salary of the staff is paid from this fund. 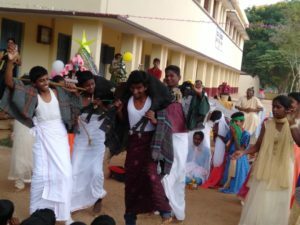 Almost every year the SSLC batch walks away with 100% results. 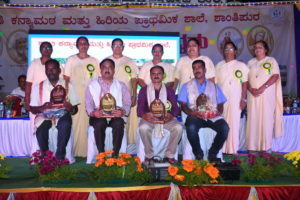 The dedicated staff and the torch bearers Sr Nelly D’Souza, (1998-2000), Sr Cecilia D’Souza (2000-2006), Sr Leena Fernandes (2006-2010), Sr Leena Barboza (2010-2013) and Sr Mary Machado(2013-2016) should get credit for this achievement. 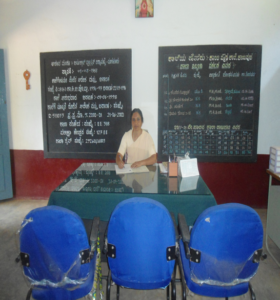 At present Sr. Cosess Gonsalves is the Headmistress of the school and works hard for the development of the students. 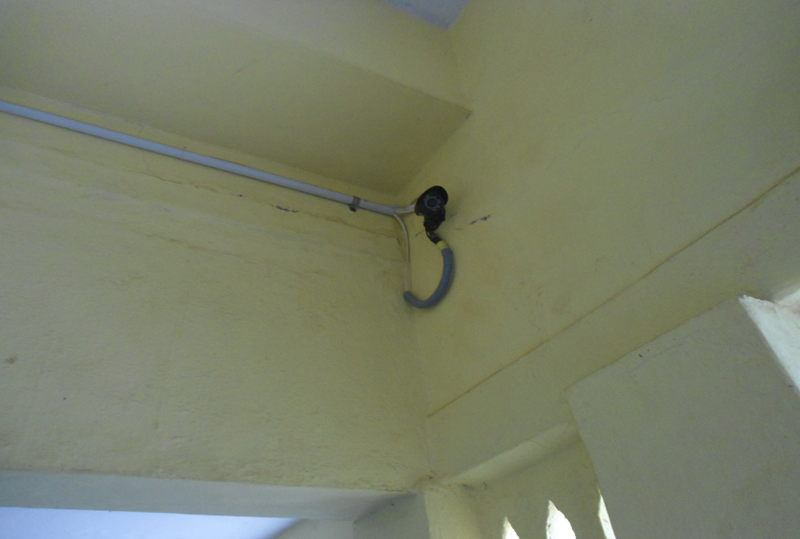 C. C. Camera was installed in 2014. 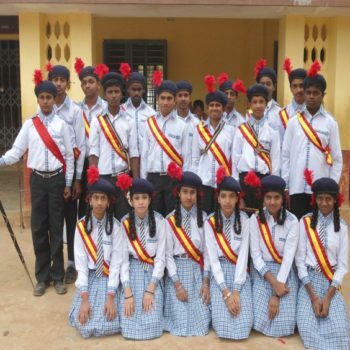 Twenty three French students visited the school along with Fr. Christian Milan in 2017. 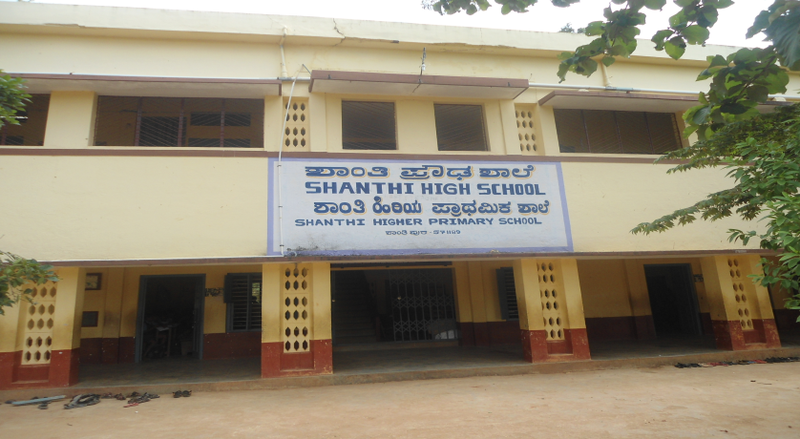 They started building the new school building for Shanthi Higher Primary School. 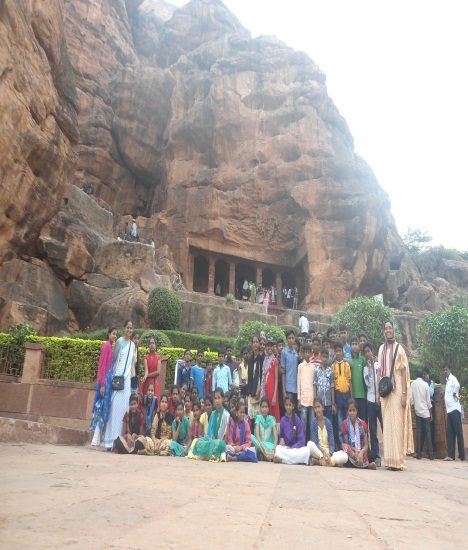 Students of High School had excursion to North Karnataka namely Bijapur, Hampi, Chitradurga and Badami in 2017 ‘Knowledge is power’ and rightly the Ursuline Franciscan Sisters at Shanthipura are empowering the people over the years through knowledge and education; willingly providing them with the ‘power’ to stand on their own feet and move ahead with human dignity. 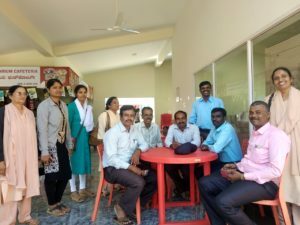 3.02.2019 to 6.02.2019: We had Superior General and President of UFES Sr.Susheela Sequeira and the Educational Secretary Sr.Lilly Pinto, who had come for visitation programme. 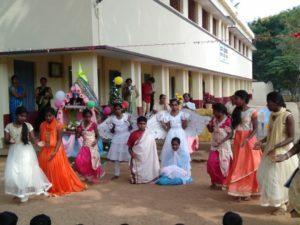 They visited the school. 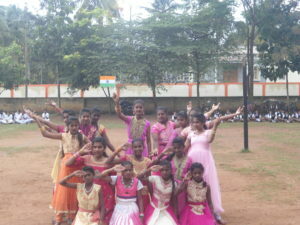 The high school and the primary school gave a small programme. The president conducted the staff meeting and had a friendship tea. 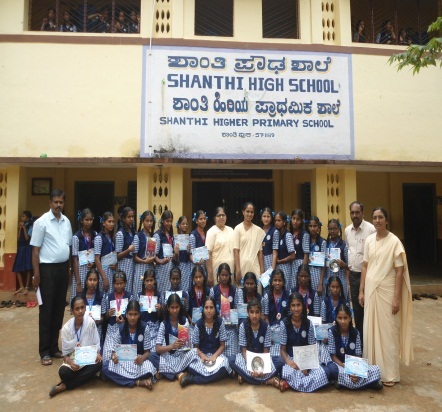 Sr.Lilly Pinto addressed the 10th std students and wished for the forth coming examination. 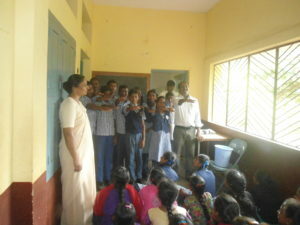 They also met the UFB students. 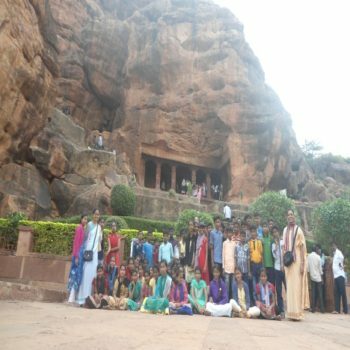 20.01.2019: we the Staff of Two schools (High & Primary) went for one day outing to Managlore. 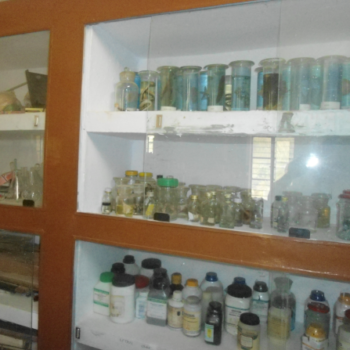 We Saw the Pilikula Science Exhibition, nearby places and Panambur beach. We enjoy the day to the full. 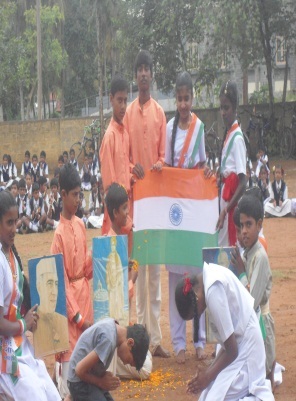 26.01.2019: we the School celebrated the Republic day. 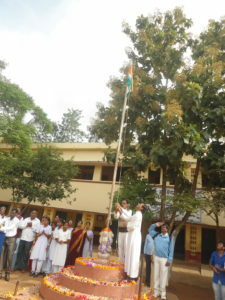 Our retired teacher Mis Anthoniyamma hoisted the Flag. 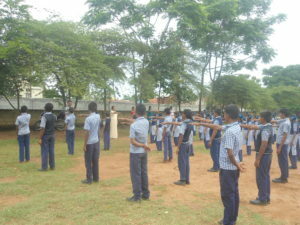 Republic speech is given by the Head Mistress of high school Sr Cosses Gonsalves. 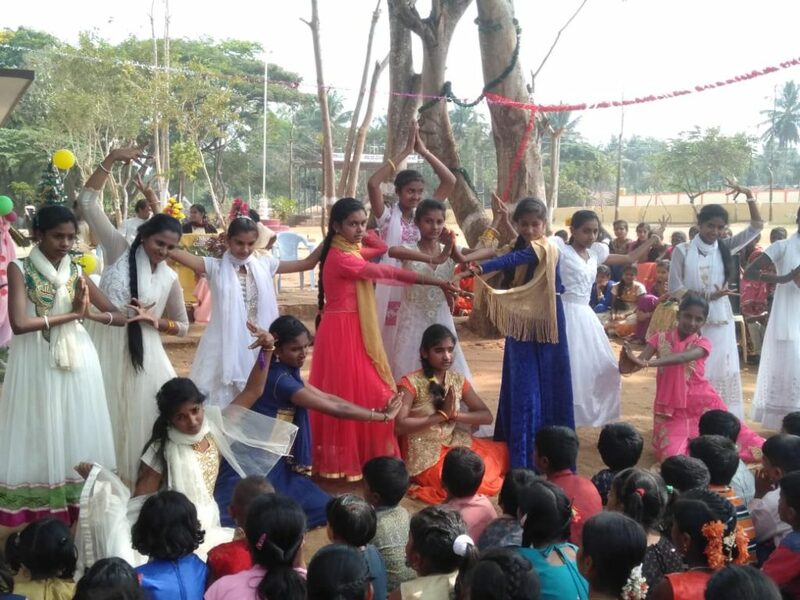 Students honoured the Nation through their Dances Songs & Skit. The surrounding people bear the witness. 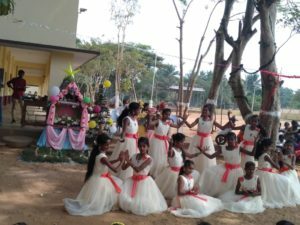 17.11.2018: Shanthi convent and the primary School celebrated the Golden years. Morning had the Holy Eucharist, Rev. 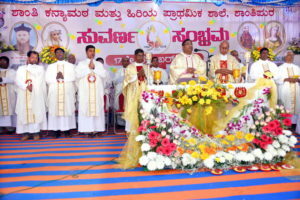 Fr K.A.Willam, Bishop of Mysuru was the main celebrant and the priest concelebrated with bishop. 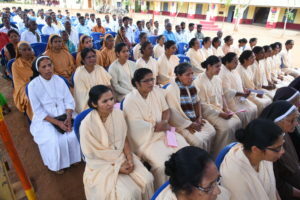 Many sisters of our congregation were present. Rev. 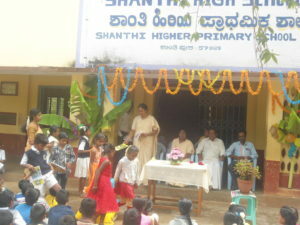 Sr Susheela. 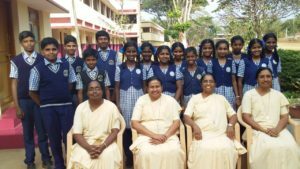 Mother general, Sr Lilly pinto the Secretary, Sr Juliana Pinto the General council and from Mangalore Province sisters were present. 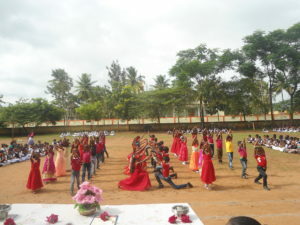 In the Evening school function was held. 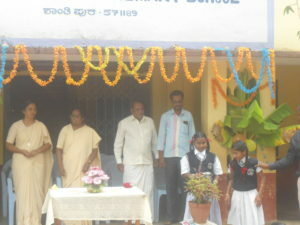 Sr.Susheela sequira the presedent of U.F.S was the president for this function. Hunsur M.L.A vishwanath, our education department Mr.Nagaraj B.E.O, Mr.Rajashekar ECO , Mr.Keshava CRP were present. 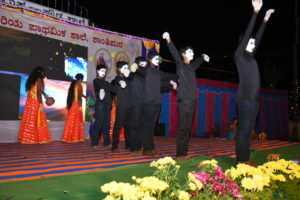 Students gave wonderful programme. 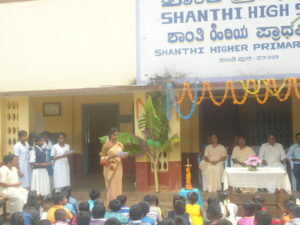 The hard labour of the Previous Headmistress work was recognized. 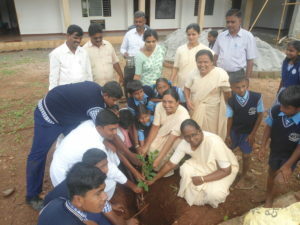 The Primary Headmistress Sr.Arogya mary And the High Head Mistress Sr.Cosses Gonsalves were Present for this function. 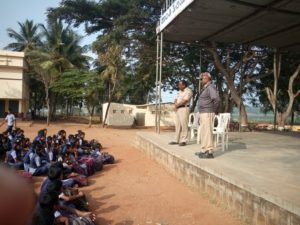 22.09.2018: The Shanthi high school had P.T.A general body meeting. 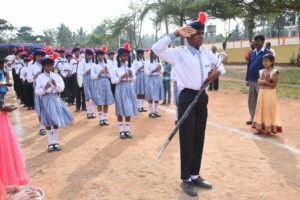 Sr Cosses Gonsalves was the President of this function. 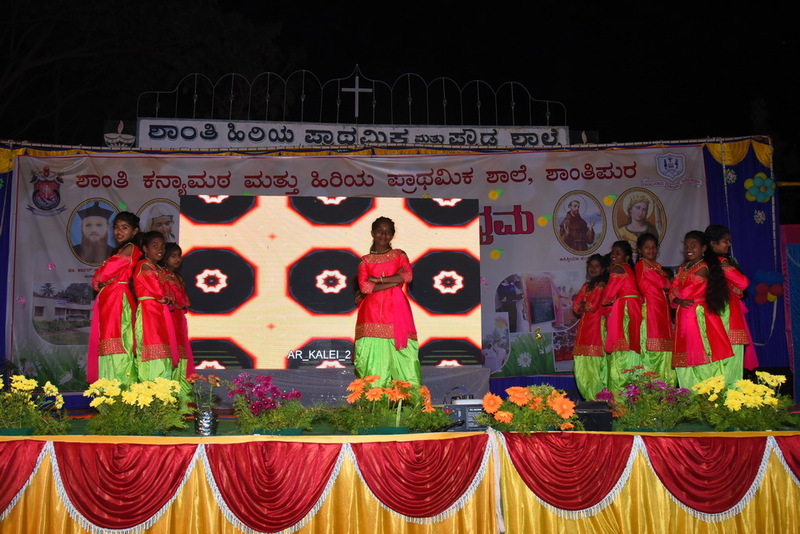 Sr.Arogya the superior of the convent was present. 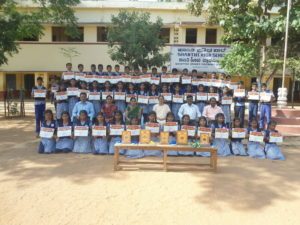 The President gave the talk on how to care of the children and influence of Mass Media. 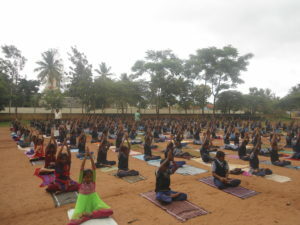 There were 100 parents were parent for this meeting. 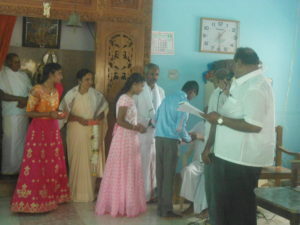 Then we selected the vice president and other executive members. 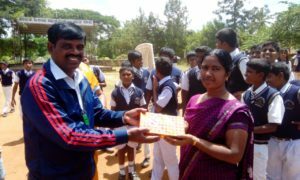 Then we had the games for the parents and grabbed the prizes. 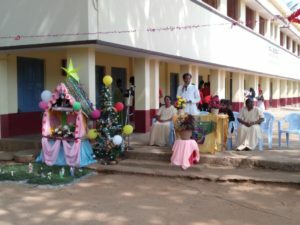 9.9.2018: On behalf of Nativity feast, our Ursuline Franciscan Blooms had a competition on vegetable decoration.10 students participated in it. 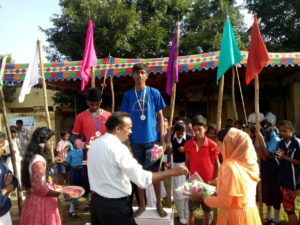 First and second given the prizes. 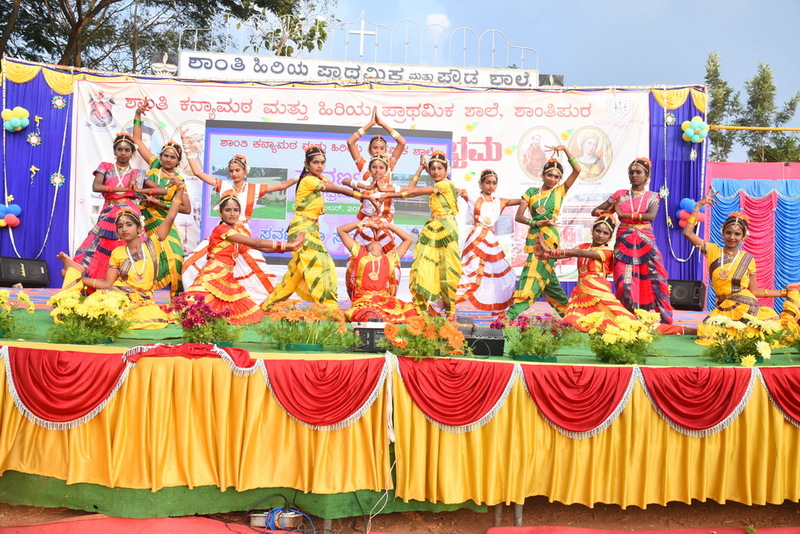 6.09.2018: Our school participated in Parthibha Karanji in Hundimala cluster.They participated in Bharatha Natya, Rangole, Janapada Dance, and Speeches in three languages etc… and won the Prizes. 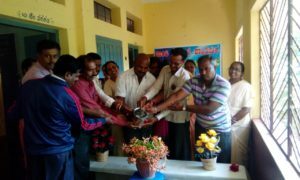 05.09.2018: We celebrated teacher’s day in simple manner. We collected the fund and given to the relief work of Madekere. 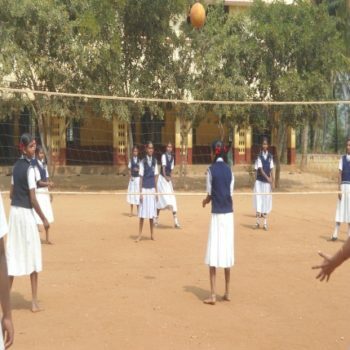 3.09.2018: The Shanthi High School students participated, High Sports in Ratnapuri, Hunsur. 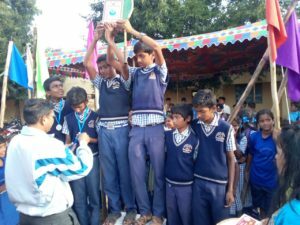 Our Students participated in various games Trowball of boys, Vally ball of Girls, Athletics, co-co both boys and girls and won many prizes in Zone level. 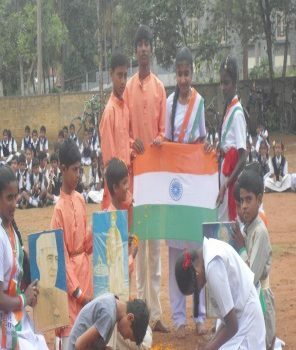 On 15th August celebrated Independence Day. 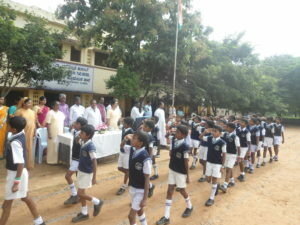 The High & Primary School together with the parents we saluted the nation with colorful activities. 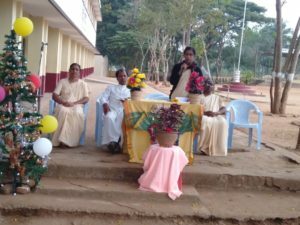 For the year 2018-19, the first U.F.B (Ursuline Franciscan Bloom) was inaugurated by the Head Mistress Sr Cosses Gonsalves. 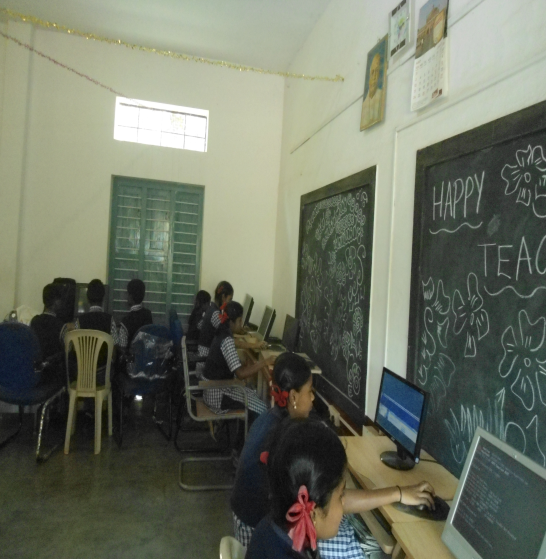 There are 15 students who are actively participating in the programme. 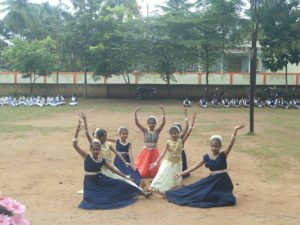 Kumari Vimala Sneha is the president and Martin vice president and Venutha Neha secretary for the bloom. 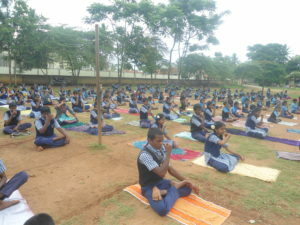 We had ‘Yoga Day’. 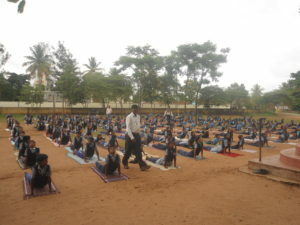 Our Physical education master Mr.Suresh K inaugurated the day and gave importance of the day. The School conducted election. Through this we formed the parliament. 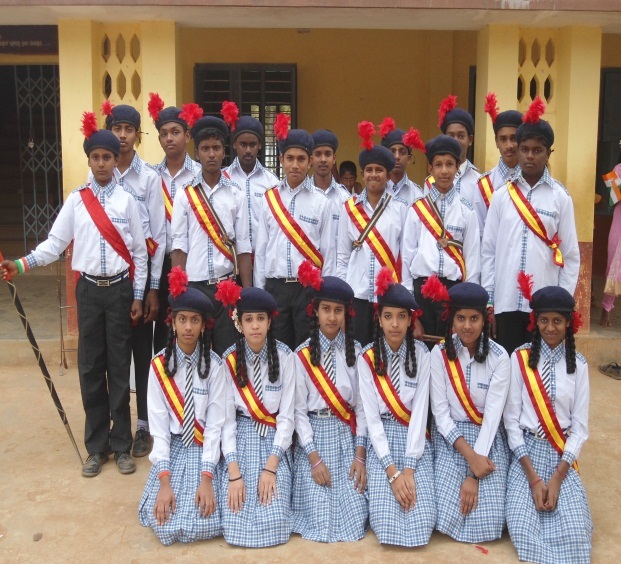 School’s captain Mr.Prajwal K R and Vice-Captain Kumari Sushma. 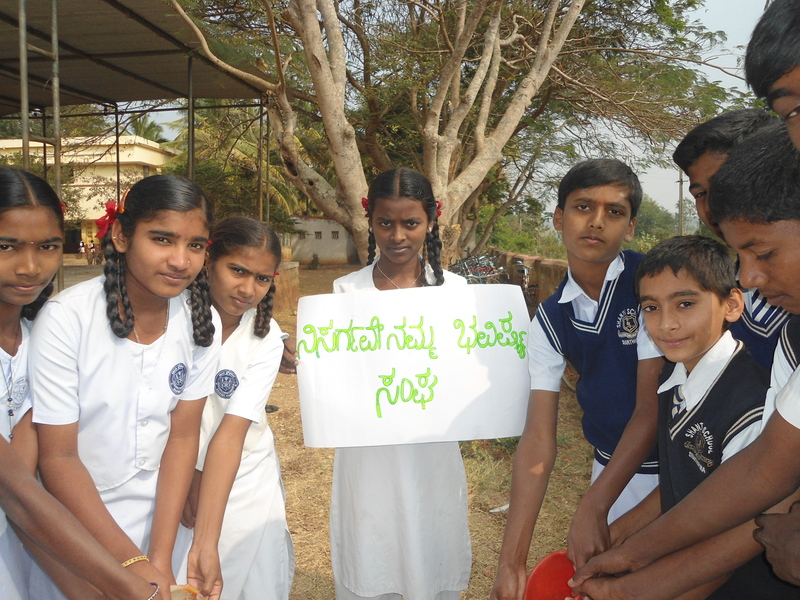 We the school conducted ‘Save earth, Heal Earth’ Programme along with environmental day “Vanamahostava’. 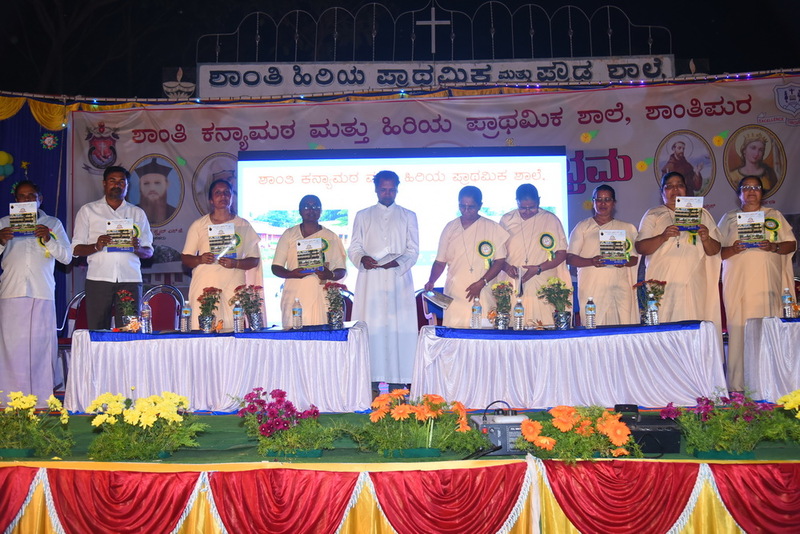 Rev.Fr.Naveen Bal Kumar, the parish priest of Shanthipura gave a talk on ‘How to Save the earth’ and planted the saplings. 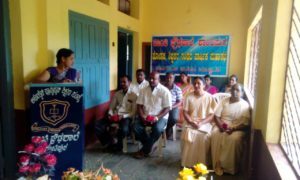 The Health and Hygiene awareness program was conducted by the Nurse Bhaya. 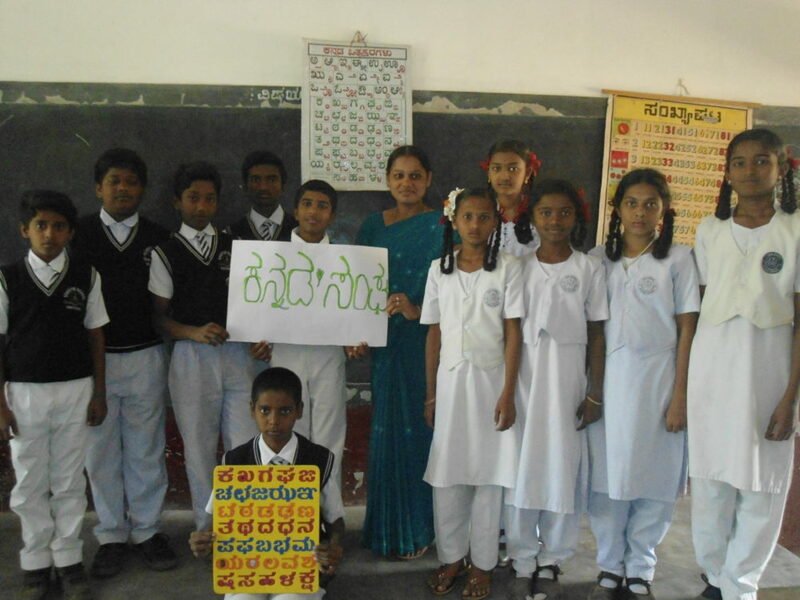 She also gave awareness on the Nypha fever & contagious disease. 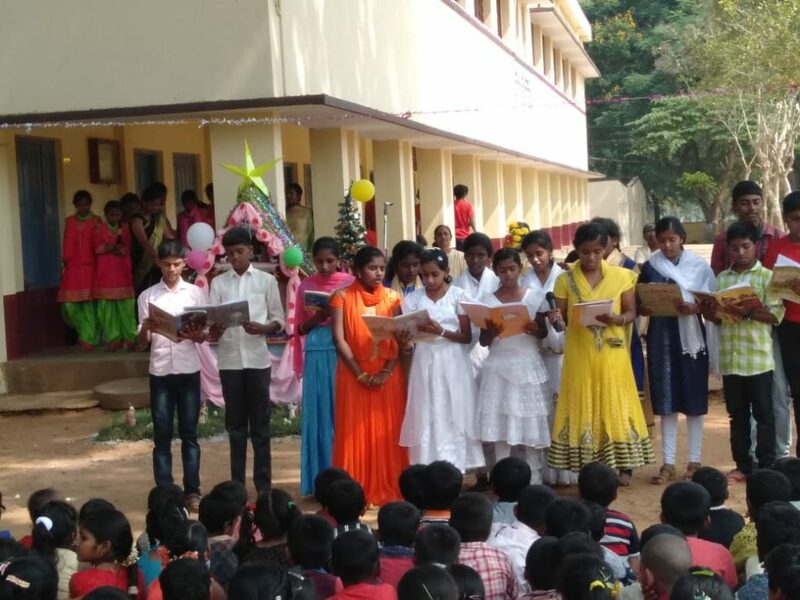 Our 3 Students got “Prathiba Puraskar” from the Geetha Trust, Gaddige, for the year 2018-19 for S.S.L.C Result. 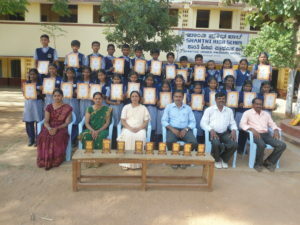 The Students got cash prize and they thanked the Management. 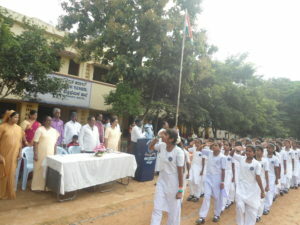 Our School opening ceremony was done by conducting prayer service. 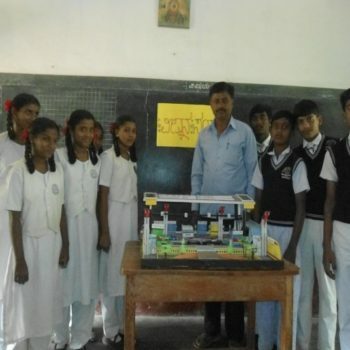 The P.T.A, S.D.M.C and teachers were present.